As a business owner, you rely on your technology to keep your business running. Unfortunately, computers sometimes have other plans. Far too often, programs that are essential to your business do not perform as expected. For an easy way to ensure your technology keeps working, you may want to consider hiring an IT partner. For more information, see our previous post, Stop Wasting Time with IT Issues. Although having a complete IT department may save you time, you still might want to try to fix problems your self, especially when they seem small. 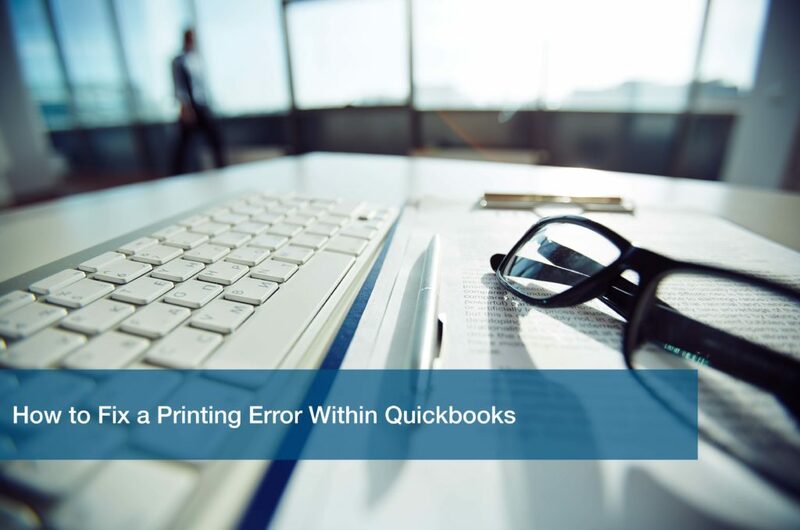 Most Quickbooks issues seem like an easy fix, but they often end up becoming part of a larger problem, especially with printing. A printing error can be one of the most difficult to fix, because of the wide variety of possible causes. Use our guide below to find the cause of the problem and resolve it. The first step when diagnosing a printing error is to make sure the printer isn’t the culprit. To diagnose this issue, start by trying to print a different document. Doing this will allow you to figure out if the printer or the program is causing the problem. If that document printed, check with others to see if they can print the document you need. Other users may not have the same issue as you, and it may print easily for them. If it does, the fault lies within your computer. The template you are using may be the issue. To diagnose this, try printing the document with another template. If the document prints without errors, the original template is corrupt. To fix this, you can replace the existing template with a new one. You can do this by selecting “Lists”, then “Templates” on the top menu bar of Quickbooks. Creating a new template to use may fix your issue and get Quickbooks working again. If none of these steps have helped to fix your printing error, it may be best to try to use a work around. The easiest of these is to save files in a PDF format, then copy and paste them from the server to your desktop. Then, print the file from your desktop. To use this work around as a long term solution, you need to save the PDF in Quickbooks then locate the file on the server. Then, right-click the icon for the file and choose “copy”. Navigate back to your desktop, then right-click on the location you wish to save the file to. Choose the “paste” option. The file should now be accessible in both locations. The easiest and most effective way to handle these errors in Quickbooks is to not handle them at all. Business owners don’t need to waste their time fixing IT issues. Call ITC to get help from an experienced team that will have your issue fixed fast so you can get back to your business. To remain productive, your business needs its technology to run at peak efficiency. When Quickbooks fails, your company can face downtime, which will cost your business. ITC makes sure these issues do not affect your company’s productivity. Call ITC today for any issues you may be experiencing, so we can help you focus on your business.